Tyrannosaurus (/tᵻˌrænəˈsɔːrəs, taɪ-/, meanin "tyrant lizard", frae the Ancient Greek tyrannos (τύραννος), "tyrant", an sauros (σαῦρος), "lizard") is a genus o coelurosaurian theropod dinosaur. 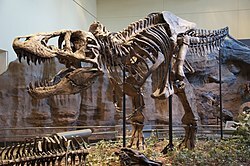 The species Tyrannosaurus rex (rex meanin "king" in Latin), is ane o the maist well-represented o the lairge theropods. Tyrannosaurus lived throughout what is nou wastren North Americae, on what wis then an island continent kent as Laramidia. Tyrannosaurus haed a much wider range than ither tyrannosaurids. Fossils are foond in a variety o rock formations datin tae the Maastrichtian age o the upper Cretaceous Period, 68 tae 66 million years ago. It wis the last kent member o the tyrannosaurids, an amang the last non-avian dinosaurs tae exist afore the Cretaceous–Paleogene extinction. Lik ither tyrannosaurids, Tyrannosaurus wis a bipedal carnivore wi a massive skull balanced bi a lang, hivy tail. Relative tae its lairge an pouerfu hind limms, Tyrannosaurus fore limbs war short but unuisually pouerfu for thair size an haed twa clawed deegits. The maist complete specimen meisurs up tae 12.3 m (40 ft) in lenth, up tae 3.66 meters (12 ft) taw at the hips, an accordin tae maist modren estimates 8.4 metric tons (9.3 short tons) tae 14 metric tons (15.4 short tons) in wecht. Awtho ither theropods rivaled or exceedit Tyrannosaurus rex in size, it is still amang the lairgest kent land predators an is estimatit tae hae exerted the lairgest bite force amang aw terrestrial ainimals. Bi far the lairgest carnivore in its environment, Tyrannosaurus rex wis maist likely an apex predator, preyin upon hadrosaurs, airmoured yerbivores lik ceratopsians an ankylosaurs, an possibly sauropods. Some experts, houiver, hae suggestit the dinosaur wis primarily a scaivenger. The quaisten o whether Tyrannosaurus wis an apex predator or a pure scavenger wis amang the langest ongoing debates in paleontology. It is acceptit nou that Tyrannosaurus rex actit as a predator, an opportunistically scaivenged as modren mammalian an avian predators dae. Mair than 50 specimens o Tyrannosaurus rex hae been identifee'd, some o which are nearly complete skeletons. Soft tissue an proteins hae been reportit in at least ane o thir specimens. The abundance o fossil material haes allaed signeeficant resairch intae mony aspects o its biology, includin its life history an biomechanics. The feedin habits, pheesiology an potential speed o Tyrannosaurus rex are a few subjects o debate. Its taxonomy is an aa controversial, as some scientists conseeder Tarbosaurus bataar frae Asie tae be a seicont Tyrannosaurus species while ithers mainteen Tarbosaurus is a separate genus. Several ither genera o North American tyrannosaurids hae an aa been synonymized wi Tyrannosaurus. As the aircheteepal therapod, Tyrannosaurus is ane o the best-kent dinosaurs, an haes been featurt in film, advertisin, an postal stamps, as well as mony ither types o media. ↑ 4.0 4.1 Hutchinson, J. R.; Bates, K. T.; Molnar, J.; Allen, V.; Makovicky, P. J. (2011). "A Computational Analysis of Limb and Body Dimensions in Tyrannosaurus rex with Implications for Locomotion, Ontogeny, and Growth". PLoS ONE. 6 (10): e26037. doi:10.1371/journal.pone.0026037. PMC 3192160  . PMID 22022500. ↑ "Sue Fact Sheet" (PDF). Sue at the Field Museum. Field Museum of Natural History. ↑ Therrien, F.; Henderson, D. M. (2007). "My theropod is bigger than yours ... or not: estimating body size from skull length in theropods". Journal of Vertebrate Paleontology. 27 (1): 108–115. doi:10.1671/0272-4634(2007)27[108:MTIBTY]2.0.CO;2. ISSN 0272-4634. ↑ Snively, Eric; Henderson, Donald M.; Phillips, Doug S. (2006). "Fused and vaulted nasals of tyrannosaurid dinosaurs: Implications for cranial strength and feeding mechanics" (PDF). Acta Palaeontologica Polonica. 51 (3): 435–454. Retrieved October 8, 2008. ↑ Meers, Mason B. (August 2003). "Maximum bite force and prey size of Tyrannosaurus rex and their relationships to the inference of feeding behavior". Historical Biology: A Journal of Paleobiology. 16 (1): 1–12. doi:10.1080/0891296021000050755. This page wis last eeditit on 4 Juin 2017, at 01:51.